"Sampath Speaking" - the thoughts of an Insurer from Thiruvallikkeni: new patriotic alphabets in Siberian School and Tamil way of learning !! new patriotic alphabets in Siberian School and Tamil way of learning !! Crimea and its annexation by the Russian Federation have occupied much of the news….. the process caused much controversy and is viewed by NATO leaders as illegal annexation that began following Russian intervention in the Autonomous Republic of Crimea and the city of Sevastopol. Russia strongly opposes the aforementioned view as "offensive towards the inhabitants of the peninsula. First, Russia sent in troops to reclaim the Crimean peninsula. Now, it’s dispatching tens of thousands of school kids to help boost Crimea’s struggling tourism industry. Faced with the prospect of a disastrous tourist season this summer in Crimea — just months after it invaded — Moscow has come up with a way to help its newly annexed territory. It is encouraging parents to send school kids for a holiday vacation on the shores of the Black Sea. Well, that is not the subject matter of this post. The Russian alphabet uses letters from the Cyrillic script. The modern Russian alphabet consists of 33 letters. The Cyrillic script is an alphabetic writing system employed across Eurasia.Children of the Commonwealth Nations learnt language through the nursery rhyme ……………’ A for apple; B for ball; C for Cat, D for dog; E for elephant; F for frog; G for goat’ ………….., in someways, the alphabets were taught with reference to material things – that is their way of life. Back home in Tamil land, there lived a great poetess Avvaiyar (some suggest that there were more than one with that title which would mean ‘respectable woman’)… the first of them lived in Sangam period and was patronized by Athiyaman. Her contributions find a place in Purananuru too. More important is the Aathichoodi ( ஆத்திச்சூடி), a collection of single-liners which teach good habits, discipline and good works for the humanity. The report states that in a sign of the times, children are taught the 'to love the motherland' after the return of Crimea and Sevastopol to Russia. 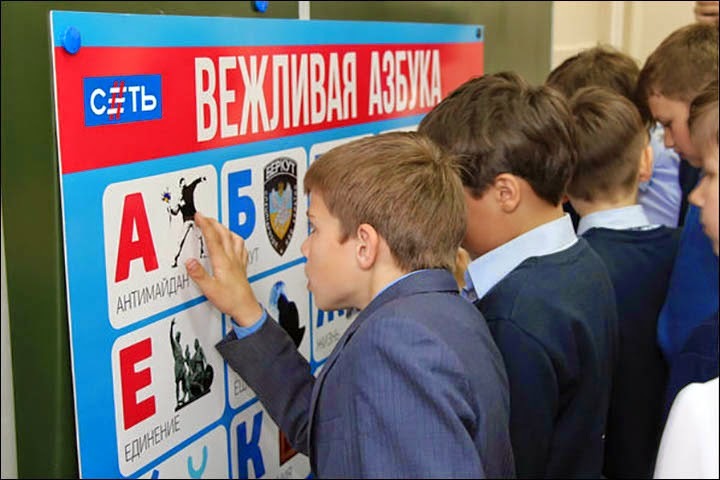 A new meaning for the 33 letters in the Russian Cyrillic alphabet has been unveiled to children in an Irkutsk school. With letters like С (S) for Sevastopol, Я (Ya) for Yalta, and П (P) for Putin, the educational tool emphases the current wave of patriotism in the country. Other letters are Д (D) for Donetsk, Г (G) - for Granitsa meaning 'border', E for Edineniye or Unity, И (I) for Istoriya or History, and Л (L) for Lyubov, or Love. A is for Anti-Maidan - opponents of the forces which overthrew the government of President Viktor Yanukovych, and Б (B) is for Berkut, the special forces in pre-revolutionary Ukraine. The alphabet, unveiled to students at School Number 11 in Irkutsk region, is the brainchild of a new all-Russian youth project called Set' (Network). It is named the 'polite alphabet' in honour of the so-called 'polite' forces deployed in Crimea. 'By the end of spring all city schools will be provided with such alphabets,' explained the group's website. Set' (Network) is a youth education project working in 11 regions of Russia from Kaliningrad to Vladivostok. They describe themselves as an 'association of young people around the new Russia'. As they say, 'we understand changes taking place in Russia', which are 'the sign of accumulated forces, the sign of reviving state, our right to a share of the world and the world’s rules’.